Sony DR-BT160AS Sport Bluetooth Headphones | OhGizmo! Someday bluetooth equipped headphones will be indistinguishable from regular models, but unfortunately today is not that day. 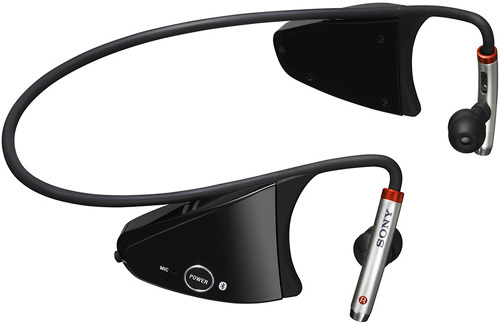 And that’s why these new DR-BT160AS ‘Active’ stereo headphones from Sony feature a large pod on either side to accommodate batteries as well as the bluetooth reciever. On the plus side, if you’re a runner or like to listen to music during physical activities, you won’t have to deal with a pesky cord bouncing around and can instead stream music from a bluetooth friendly MP3 player or cellphone. The headphones also includes a built-in mic allowing you to make or take calls if you are using it with a phone, and a set of playback buttons for remotely skipping tracks or adjusting the volume. The soft elastomer hangers feature a sliding earpiece shaft ensuring a secure and comfortable fit, and the whole thing is splashproof meaning sweat won’t hurt it, but you’ll probably want to keep it out of the rain. Expect it to be available from the Sony website sometime in October. These are interesting, thanks for posting.